Home NHL Rumors What’s In Store For The Vancouver Canucks This Summer? For the fourth straight season and the fifth time in six years, the Vancouver Canucks will miss the Stanley Cup playoffs. Nevertheless, there are signs this rebuilding club could be finally heading in the right direction. Through most of the first half, they were in contention for a playoff spot. Their 78 points (in 79 games) are the highest since reaching 101 points in 2014-15. They’re also sitting fifth in the Pacific Division, their highest placement since ’14-’15. Rookie Elias Petterson is expected to become the first Canuck to win the Calder Memorial Trophy since Pavel Bure. Center Bo Horvat established himself as a strong two-way forward and leader. Despite being sidelined by early-season injury, sophomore winger Brock Boeser matched last year’s 55-point performance. Jacob Markstrom finally emerged as a reliable starting goaltender. 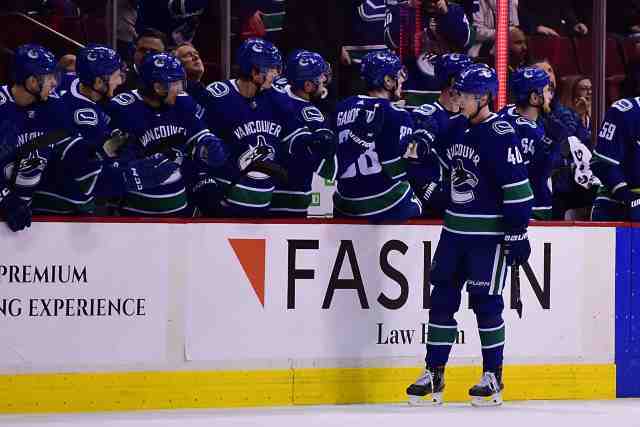 Had injuries not sidelined key players such as Petterson, Boeser, defensemen Alex Edler and Chris Tanev, and forwards Sven Baertschi and Brandon Sutter, perhaps the Canucks would’ve had a better shot at clinching a playoff berth. Then again, if they had a deeper roster, those absences wouldn’t have been so costly. Despite the potential of their young players and the signs of improvement, the Canucks still have a lot of work to do to become a playoff contender next season. As ESPN.com’s Greg Wyshynski and Chris Peters recently observed, the Canucks need to invest in skill this summer. They’re lacking secondary scoring and are in dire need of blueline depth, especially on the right side. Cap Friendly indicates the Canucks have over $51.4 million invested in 18 players for 2019-20. General manager Jim Benning will have over $32 million to work with, assuming the salary cap reaches $83 million as projected. Ownership isn’t likely to approve spending to the cap for next season. Still, there should be sufficient room left to re-sign core players such as Edler (pending UFA) and Boeser (RFA) and still leave enough to bolster the roster depth. After getting burned with the Loui Eriksson signing three years ago, Benning could be reluctant to invest in players nearing their 30s. With the league trending toward young, speed and skill, that could be where he puts his focus this summer. On March 1, The Vancouver Sun‘s Patrick Johnston reported Benning indicated improving his defense was the priority. Johnston speculated the Canucks GM could pursue San Jose’s Erik Karlsson, Winnipeg’s Tyler Myers or Toronto’s Jake Gardiner via free agency. Failing that, he thinks Benning might pursue a trade for Winnipeg’s Jacob Trouba. It’s doubtful Karlsson will be interested in joining a rebuilding club at this stage in his career. Myers and Gardiner could also opt to sign with contenders. Trouba is slated to become a restricted free agent with arbitration rights this summer and is a year away from UFA eligibility. Unless Benning could guarantee Trouba would agree to a long-term deal, it would be folly to part with valuable assets for a player who could bolt a year later via free agency. A more intriguing option could be Buffalo Sabres rearguard Rasmus Ristolainen. He’s signed through 2021-22 with a reasonable $5.4-million salary-cap hit and lacks a no-trade clause. With the Sabres once again out of the postseason, their ownership could be growing impatient with their sputtering rebuild. Ristolanen surfaced recently in the rumor mill, but the Sabres could seek a top young forward like Petterson, Boeser or Horvat in return. Benning could also target teams looking to shed salary next season to make room to re-sign a rising young star. The Toronto Maple Leafs, for example, could be forced to move a young forward like Kasperi Kapanen or Andreas Johnsson once they’ve re-signed leading scorer Mitch Marner. The Tampa Bay Lightning might have to consider moving a salaried player like J.T. Miller or Yanni Gourde (who lack no-trade protection) to create cap room to re-sign Brayden Point. Maybe Benning can pry someone like Nikolaj Ehlers away from the Jets, who’ll have to re-sign Patrik Laine and Kyle Connor to significant raises. Whatever moves Benning makes, they’ll be crucial for hastening the Canucks’ rebuild. He cannot afford to be too cautious or make another series of minor depth signings as he did last summer with Antoine Roussel and Jay Beagle. Another sputtering performance next season could cost Benning his job.